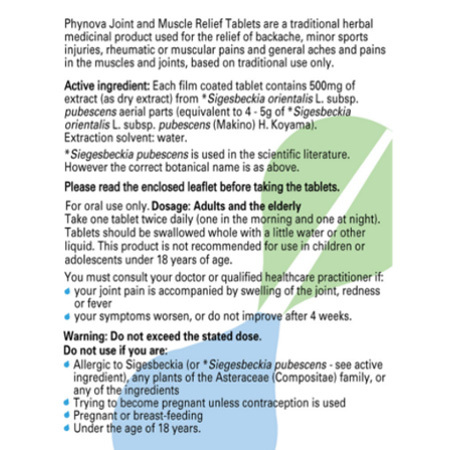 Exclusively containing Sigesbeckia extract, Phynova Joint and Muscle Relief Tablets is a traditional herbal medicinal product used for the relief of backache, rheumatic, joint and muscle pain as well as minor sports injuries. Sigesbeckia has been used for thousands of years around the world to relieve painful joints and muscles. 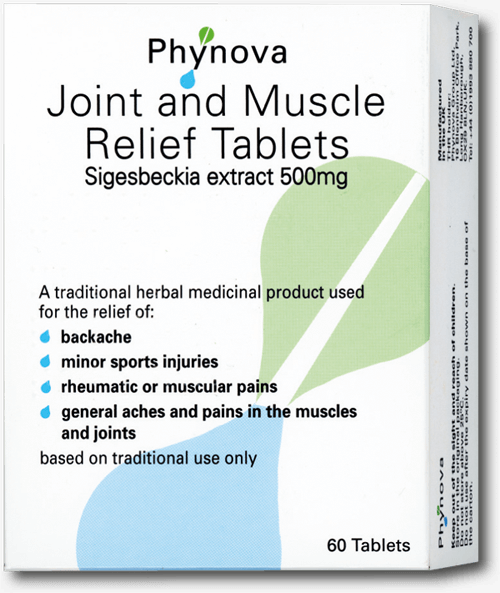 Phynova Joint and Muscle Relief Tablets is a traditional herbal medicinal product used for the relief of backache, rheumatic, joint and muscle pain as well as minor sports injuries. It carries the THR certification mark so you are guaranteed that it is made to pharmaceutical quality standards and each tablet contains what it says it does. Phynova Joint and Muscle Relief Tablets contain the active ingredient, Sigesbeckia extract. Sigesbeckia has a long history of safe use for relieving a wide range of musculoskeletal pains all around the world. For the past 30 years, it has been used in Europe, where it is now a registered Traditional Herbal Medicine for the relief of backache, rheumatic pain, joint and muscle pain, as well as minor sports injuries based exclusively on long-standing use as a traditional medicine. Take one tablet, twice daily (one in the morning and one at night). Tablets must be swallowed whole with a little water or other liquid. Do not take this product if you: are pregnant or breastfeeding, are trying to become pregnant, are under the age of 18 years, are allergic to Sigesbeckia (or Sigesbeckia pubescens – see active ingredient) any plants of the Asteraceae (Compositae) family such as daisies, marigolds or artichokes or any of the ingredients. Tell your doctor or qualified healthcare practitioner before taking this product if you are taking any other medicines, including any bought without a prescription. Backache? Joint pain? Try our herbal medicine!